This module provides to the user a measure on the barrier's effectiveness on noise reduction. A list of the input/output variables and their definitions, as well as illustrations of different scenarios are provided. View Descriptions of the Input/Output variables. Note: Tool tips, containing field specific information, have been added in this tool and may be accessed by hovering over the Input and Output variables with the mouse. WARNING: If there is direct line-of-sight between the Source and the Observer, the module will report erroneous attenuation. “Direct line-of-sight” means if the 5’ tall Observer can see the noise Source (cars, trucks, trains, etc.) over the Barrier (wall, hill/excavation, building, etc. ), the current version of Barrier Performance Module will not accurately calculate the attenuation provided. In this instance, there is unlikely to be any appreciable attenuation. h = The shortest distance from the barrier top to the line of sight from the Noise source to the Observer. The “actual barrier performance for barriers of finite length” is noted on the worksheets(in the Guidebook) as FS. Locate the cursor on the following thumbnails to enlarge the respective scenario as implementation examples of the barrier performance module. 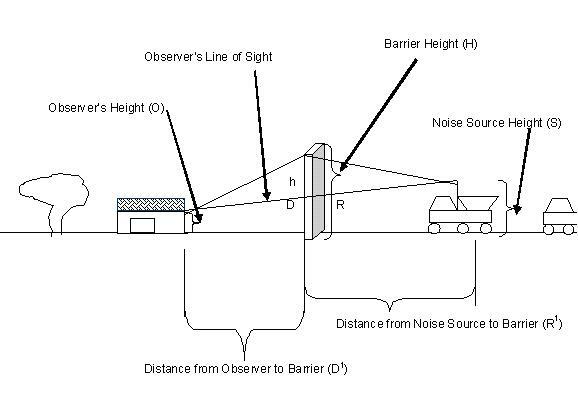 view larger version of image Noise receiver at a higher elevation than the noise source and a man-made noise barrier in between the receiver and the source. view larger version of image Noise receiver at a higher elevation than the noise source and a natural barrier (hill) between the receiver and the source. view larger version of image Noise receiver at almost the same elevation of the noise source and a man-made noise barrier between the receiver and the source. view larger version of image A noise barrier of finite length between a noise source and a receiver. This top view illustrates the angle α, subtended by the barrier at the observer’s location.